Byousoku 5 Centimeter (5cm/s) is a film in 3 episodes of 22 minutes each, by Makoto Shinkai, the creator of Kimi No Na Wa (Your Name). 5cm/s tells the tale of the ever-growing distance between two childhood friends and how their relationship changes over the years and what impact it has on the both of them. Takaki Toono and Akari Shinohara, two very close friends and classmates, are torn apart when Akari’s family is transferred to another region of Japan due to her family’s job. Despite their separation, they continue to keep in touch through mail. When Takaki finds out that his family is also moving, he decides to meet with Akari one last time. As always I would like to put a small disclaimer here. These are all my opinions and views on 5cm/s, I am in no way opposing any views anyone else may have about this movie/series. With that out of the way, let’s begin. 5cm/s depicts a very touching story in it’s 3 parts, each displaying the two main characters at different stages in their life. 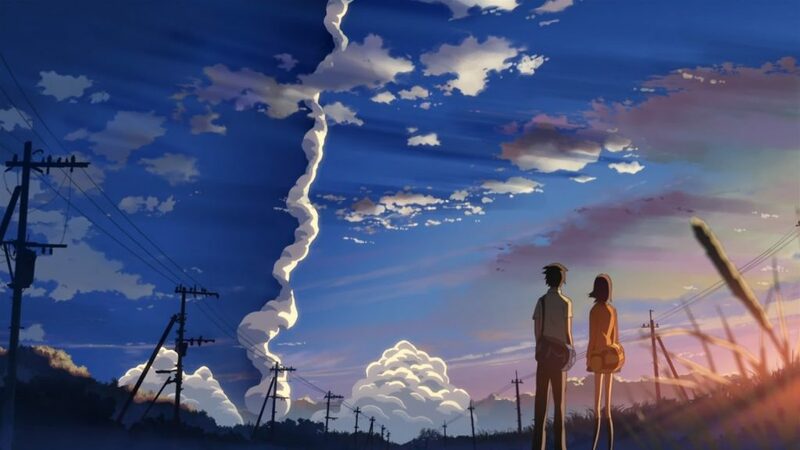 As Makoto Shinkai does, there is a lot of symbolism in this movie and the movie itself takes a very realistic outlook on life and love, giving the harsh but true message, that love does not always prevail. In that sense this work is a contrast to Your Name, in which love overcomes all boundaries and in which there is a sense of the supernatural, unlike that, 5cm/s is deeply rooted in the truth and reality and the fact that no matter what, life goes on. The story of 5cm/s is the core of it, depicting the love and connection between Takaki and Akari. Overall the story is excellently crafted and very, very emotional like most of Shinkai’s work, however, there is one hitch about it. The second episode of 5cm/s is very slow, and feels a bit detached from the other two and doesn’t quite fit in as well as it should. Be that as it may, the second episode is still excellent, it’s just that the story it tells doesn’t weave as well as it should. Except for that small hitch, the story is exceptional and certainly something that is not seen that often within the Anime community as 5cm/s takes a unique outlook on the love between two characters. Since I do not believe in any spoilers in a review, I must refrain from dropping too much. However there are certain scenes between Takaki and Akari, that are beyond excellence, and the way the entire story has been weaved… well I can’t even put its brilliance into words without spoiling it. Lastly, as Shinkai loves to do, we get an open-ended end to the movie, leaving the final scenes into interpretation, however, there is one generally accepted conclusion within the community and I do recommend you read the accepted interpretation if you struggle to cope with the ending like I did. What much is there to say. Makoto Shinkai’s works are known to have the most amazing animations and I can say with confidence that 5cm/s has one of the best animation and art styles in the entire industry. More than that, the animation style actually increases the impact of the story and the characters have on you because… it’s just THAT good! The score for 5cm/s is great. No doubt about that. However it pales in comparison to the score for Kimi No Na Wa. Since they are both Shinkai works, it is hard not to compare them, and I think that even though the music and soundtrack used in this movie compliments the story and leaves an emotional impact, it cannot even begin to match up to the Kimi No Na Wa soundtrack. Relative to the soundtrack of the anime industry as a whole, the 5cm/s score is very good, and the lyrics effectively convey the emotions of the characters and set an excellent mood for each scene. The only reason that 5cm/s misses the 10/10 for Characters, is that the side characters and Akaki could have been developed more. The protagonist of the story Takaki, sees a lot of character development over the course of the story, and we are privy to his innermost feelings and emotions many times over the course of the three episodes. The side characters, mostly in episode two, have excellent development and are brilliant characters in their own right, despite the fact that they could have had a tad bit more development. However, Akaki, who some would call the deuteragonist, could have seen a lot more development, as we barely get to know her side of the story, and that is something that I dearly miss and the only issue I have with this movie. Although not as amazing and mind-blowing as Kimi No Na Wa, 5cm/s is still a very enjoyable show in its own right. I thoroughly enjoyed watching this, so much that I watched it in the middle of two exams during the break, and you can bet that I cried at the end. I had a great time watching 5cm/s, twice, and am still not unaffected by the story. The ending is a teaching and the story is a very harsh reality that everyone needs to accept, Love is not undefeatable. That being said, after the ending, I scavenged through the internet for an epilogue to soothe my frantic heart. Instead what I got was an interpretation and an analysis that calmed me down and made me realize what Makoto Shinkai was trying to teach in this movie. Do not expect to be happy or enthralled while watching it. It is only after you have finished the movie, and understood it’s meaning and appreciated Shinkai’s brilliance that you will be amazed and realize that you thoroughly enjoyed watching it. It is not a happy movie to watch, in fact, it is very sad, but once you finish it and understand the movie, the story and the characters you will understand that this is not just a movie, this was a lesson, and one of the best goddamn lessons you will ever watch, and it will reveal the truth of life to you, and open your eyes to what has been shut off from you by the repeated tropes of all media, the truth, and then, only then, will you understand the scope of this work, and finally enjoy and feel happy about it. As that is the only way one can be truly happy, after understanding the harshness of reality and true sadness. You may feel bad for the characters along the way, I certainly did, but at the end your entire view of the whole story and the characters changes. I know that was a bit repetitive but I am having a tough time writing the brilliance of this movie without spoiling it, and even if I did spoil some of it, I am not sure I’d be able to convey what this movie is to you in this article. My final words to you for Byousoku 5 Centimeter. Go and watch it, and then you will understand.